semprot. We’re only 12 sleeps away* from Glastonbury 2016! Pretty exciting, isn’t it? For the lucky people among you who already have your tickets and journeys sorted, we thought it would be great if we could give you a little slice of the festival before Worthy Farm is in sight. We’ve found some of the freshest, exciting acts performing at Glastonbury this year to perform in your car. Yep, that’s right! As you journey to Glasto you’ll be treated to your own backseat concert or live comedy show. It’s a bit like Carpool Karaoke (minus James Corden, of course)! All you need to do is register as a driver to Glastonbury on our site Ai? 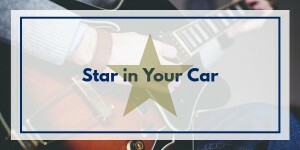 ?and then we’ll select a lucky few who will experience their own star in their car! To register your journey and be automatically in with a chance, clickAi??here. Want to know more? Drop us a line at hello@gocarshare.com. *Depends on when you read this!